Seniors today are not only realizing the benefits that exercise and an active lifestyle can bring, but many are motivated to create their own exercise regimens that include participating regularly in exercise programs and hiring personal trainers. The Baby-Boomer generation is moving into retirement years, and older seniors are living longer and want to remain active and healthy throughout their entire lives. Our bodies are made to move, but what exactly should an exercise program look like for seniors? How about seniors who have been sedentary their whole lives, and are only now deciding to make movement a part of their lives? What does an exercise program look like for older adults in their seventies, eighties, or nineties? Read on to not only find out the most important components of a senior fitness program, but also practical examples of what a senior fitness program should look like. 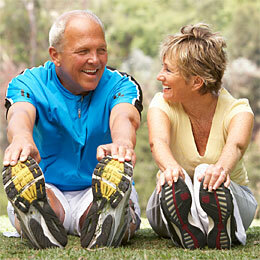 The American College of Sports Medicine’s (ACSM’s) Exercise Guidelines for Adults also includes senior adults. 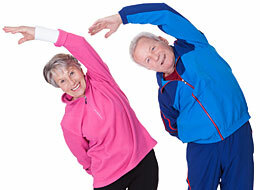 There are very few differences in ACSM’s Exercise Guidelines for older adults or seniors. All of the same components of fitness apply to seniors, with more focus on flexibility and balance. 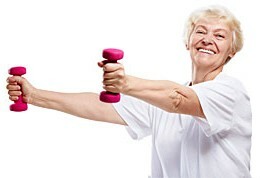 The most recent 2011 ACSM Exercise Guidelines for Adult Fitness now includes a new category or component of fitness. In addition to resistance exercise, cardiorespiratory exercise, and flexibility, there is an added recommended component of neuromotor exercise. Neuromotor exercises help develop motor skills that include balance, agility, gait, coordination and proprioception, which is the ability to know where your limbs are in space, and your body’s ability to automatically make adjustments in order to maintain balance with movement. These above four components of fitness should be included in a complete senior fitness exercise program. There are countless ways to put a senior fitness program together, and everyone’s abilities and fitness levels are completely individual, not only depending on their age but also on their lifestyle. How is their functional mobility? Do they walk with the assistance of a cane or a walker? What are their health issues and past injuries? It is vital to know your senior’s abilities as soon as possible. Assess your senior client with the Senior Fitness Test developed by Rikli and Jones, which is a battery of tests that assess the functional fitness of older adults. Once you know their abilities, begin with very basic movements and then progress them from there. Without going into the specifics of ACSM’s recommendation of frequency and duration of exercises in this article, the components or types of exercise needed are, resistance, flexibility, cardiorespiratory, and the newest added category or component of fitness, neuromotor exercise. Keeping in line with the ACSM’s recommendations of the four components of exercise, here are the building blocks for a safe, effective, and complete senior fitness program. Stretching to maintain flexibility in our joints and the ability to achieve a good range of motion in our movements is extremely important as we age. Seniors should stretch at the beginning, at the end, and throughout the workout either in a chair, or standing using a chair or another object for stability. Moving the joints gently, yet dynamically through their full range of motion, should be done to raise the body’s temperature, and increase blood flow, preparing the joints, tendons, and muscles for the workout. Every joint in the body should be warmed and readied through controlled movement. 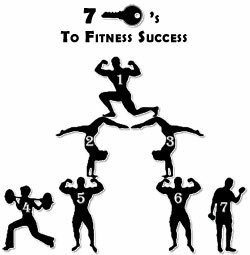 One way is to have your senior client begin at the top of the body then work down. 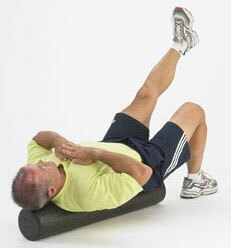 Include many everyday movements, and get them moving in all directions in a pain free range of motion. Flexibility can also be included as a gentle activity in between strength and cardiorespiratory exercises. More focus can be put on statically held stretches at the end of the workout, and throughout the workout only after the body is warmed up. Strength training will help seniors strengthen muscles for doing activities of daily living so they can be as active and remain as independent as possible in later years. Strength training can be done with resistance bands, light dumbbells, and even with body weight. Working the body on one side or unilaterally can help seniors to master the movement and technique of the exercise, as well as allow one side of the body to rest. Traditional upper body strengthening exercises like rows, resistance band chest presses, biceps curls, and shoulder raises are exercises that mirror everyday life movements and should be included. Chair stands are vital. Have your senior client practice rising from a chair to a complete stand, then lower back down to a seated position. This is the most important exercise we will do as we age. 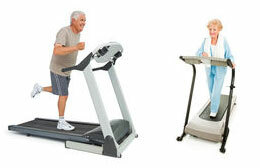 Cardiorespiratory exercise is extremely individual based upon the seniors’ abilities. Cardio exercises for seniors can be as basic as marching or laterally side stepping in place, or doing these same movements while seated in a chair. If it fits their abilities, encourage upper body movement at the same time as lower body movement for certain exercises. Add varying types of stepping or marching such as a wide march to a narrow march. In general, seniors should not do cardiorespiratory exercise to fatigue. Rest breaks of a few minutes should be taken every several minutes. Seniors will put healthy stress on their heart and lungs and increase their circulation and endurance with these basic aerobic movements. Neuromotor exercises are movements that focus on balance, coordination, agility, gait and proprioception. Proprioception is being aware of where your limbs are in space, and how your muscles must adjust to keep you balanced and stable as your body moves. Neuromotor training is especially important for seniors, because it is an important defense in fall prevention. One of the most basic examples is to prepare to stand up from a chair. Ask your senior client to focus on their posture, their foot position, getting their body into proper alignment to prepare to stand up. Then have them do so, and remind them to remain aware of their full body’s alignment. Eventually, movement progressions can be added to focus on all elements of neuromotor training. My favorite example of this is demonstrated in the Senior Fitness Test’s, “Eight foot up and go Test” that was developed by Rikli and Jones. In this test that assesses agility and dynamic balance, a senior comes to a complete stand from a chair, briskly walks toward and then around a cone placed eight feet from the chair, returns to the chair, turns and sits back down. Not only strength and power, but also dynamic balance, agility, coordination and proprioception are developed in this task. 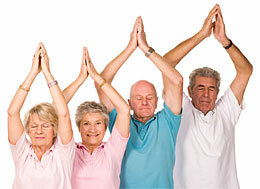 Be creative and come up with other everyday movements for senior specific neuromotor training. These are just some ideas and examples of what a complete senior fitness exercise program should look like using the four components of fitness recommended in ACSM’s Exercise Guidelines for Older Adults. Most importantly, strength, flexibility, neuromotor, and cardiorespiratory training should be specifically modified to the abilities of senior clients whether in their sixties or nineties. By including these four important components of fitness, you can build a well-balanced senior fitness program to safely and effectively help seniors maintain and develop strength, mobility, better balance and agility, coordination, cardiorespiratory fitness and flexibility. 1. American College of Sports Medicine – http://acsm.org/about-acsm/media-room/news-releases/2011/08/01/acsm-issues-new-recommendations-on-quantity-and-quality-of-exercise; New Releases: New Recommendations on quality and quantity of exercise, August 2011. 2. Rikli, R. & Jones, C.J. (2001). Senior Fitness Test Manual, Champaign, IL: Human Kinetics. 3. Petersen, T. (2008). Sr Fit Second Edition: The Personal Trainer’s Resource for Senior Fitness, ed. Bazzle, P., American Academy of Health and Fitness.